DiamondQuest is a sustainable flooring solution that can transform the look of a facility in both new construction and open remodel projects with the installation completed at night or during weekends. DiamondQuest takes porous concrete (a sustainable material) and transforms it into a highly reflective dust-free surface. 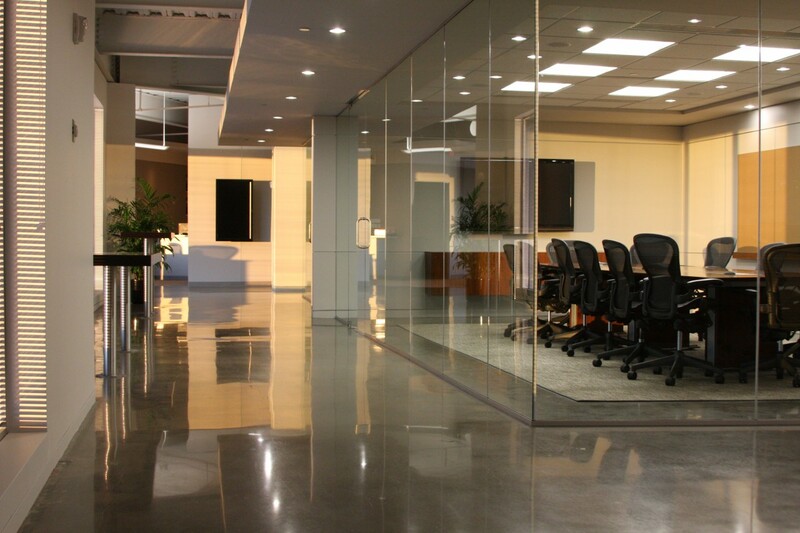 Polished concrete reduces maintenance costs, minimizes cleaning and increases the durability of the floor. Why is a DiamondQuest floor surface easier to clean? Polished concrete reduces the surface area pores that trap dirt. With a flat, smooth surface, the dirt stays on top of the floor and, thus, requires less cleaning (and less cleaning products). A DiamondQuest floor surface is more sanitary than tile floors because there are no seams or joint lines to hold the dirt. We will provide the instructions and materials for cleaning the floor. QuestMark offers a gloss and dust proof Aesthetics Warranty – unique in the flooring industry. We’re guaranteeing your shiny floor as long as you properly clean and maintain the surface. Speaking of aesthetics, there are over 20 colors to finish the polished concrete to your style, décor and preference. DiamondQuest floors also increase safety by decreasing slips and falls. The National Floor Safety Institute certifies the floor system as a slip resistant flooring process. Here’s the bottom line: DiamondQuest is a concrete floor system that has a consistent shine, low maintenance requirements, a warranty for gloss and shine, safety certifications, an increased life span and a green flooring footprint.